From the moment you step on our lot until the time you drive away in your next car, your buying experience with SKCO Automotive is our number one priority. We encourage you to use the expertise and resources of our sales staff; they are here to help you find the right car at the right price. Our staff is fun, knowledgeable, professional and well trained. When you choose to do business with us, we guarantee that our staff will provide you with all of the information upfront. This leads to the peace of mind that you are purchasing from an establishment founded on integrity, commitment to customer enthusiasm, accountability at all levels and commitment to continuous improvement represented by the SKCO Automotive. Every customer’s time is valued, and we strive to build meaningful relationships with all of our customers. When any customer comes to buy a preowned car, or any service, to us it is much more than just a transaction. We pledge to work as a team, harnessing our diverse individual skill sets and strive to bring the best out of ourselves to help each and every customer to the best of our abilities. As part of Team SKCO, we have been upholding the value of integrity in every action and transaction. The result? Customer satisfaction. 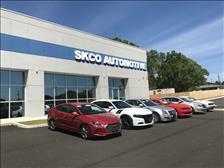 We take pride in providing customers a premium, memorable experience at SKCO AUTOMOTIVE We offer the largest and most complete selection of used cars in Mobile, Pensacola, Gulfport area. We are committed to providing exceptional service and exceeding our customers' needs, we constantly strive for excellence in character and quality within every aspect of our business. All our vehicles are competitively priced to give you the best and the highest possible value for your money. We offer a number of special offers on our Pre-Owned vehicles. Our financial experts work hard to provide you with the most viable financing options. Our certified technicians deliver outstanding service and excel in understanding the needs of the customers. Our service center houses the highest trained technicians in the market to serve all your vehicle service needs.